This unique instructional video features Coach Nappy Napoleon and has something to offer for both novice and seasoned paddlers. Besides general technique, Nappy covers each seat in the canoe as well as his invaluable commentary on steering both for open ocean and regatta racing. Also included are sections on doing changes, rigging and dealing with hulis plus baclground information on paddling’s origins and Nappy’s own slack key background music. 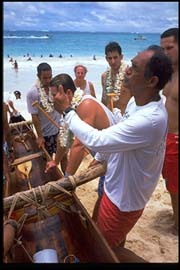 Most of all, this video comes straight from the heart of a humble, extremely knowledgeable individual with over 45 years of competitive outrigger competition who has now realized a dream of being able to share his expertise with paddlers everywhere. Cinematography by Lew Trusty-whose images have been featured inNational Geographic books, magazines, TV specials, and Baywatch Hawaii). Directed and produced by Ann Marie Kirk -whose work has been shown nationally and internationally on Public Television and FilmFestivals. Now available on DVD complete with index and outrageous outtakes @ $ 24.95 each. Original Videotape version @ $22.95 per tape. Please add $3.00 S/H for US orders and $5.00 for International.